You know that your field service business needs to earn a profit or you'll, well, go out of business. So not only do you work to bring on more customers, but also to cut costs: You look for the cheapest parts, the most inexpensive software and supplies, and services that are (way) below market price. At first you feel like a real winner who's outsmarted the system...until those parts start to break down, the software has more bugs than an entomology museum, and no one's around when you call to get these problems fixed. Congratulations: You've just had your first encounter with false economy. This is when you take an action that saves money at the beginning, but ends up wasting money in the long run. Even worse, when you refuse to invest in the kind of equipment and services that let you do your best work, you end up failing both yourself and your customers. We'll take a look at some of the common supplies and services field service businesses typically invest in, show you why cheaper isn't better, and offer advice on how to get the best of what you need without going broke—so you can provide the best service to your customers and earn more in the end. Your office staff need computers with the power and capabilities to let them do their jobs quickly and efficiently. Cut corners on this purchase, and your whole business can slow to a crawl as your employees struggle with sticky keyboards and trackpads, low battery life, low memory, and sub-par speakers, according to the article 'Cheap Laptops: Good Deal or Waste of Money?' on the MakeUseOfWebsite. Say you invest in a £2,000 desktop computer for your office manager instead of a £400 PC. Let’s assume that employee will be sitting at the keyboard seven hours a day, five days a week (minus holidays), for three years—which, it so happens, is the length of the computer’s warranty. That’s 5,250 hours over three years, which comes out to just 38p per hour for your office manager to use the best, fastest, most efficient computer you can buy...and this doesn’t count the savings you’ll enjoy due to higher productivity. That doesn't mean you have to strain your bank account to purchase the most high-end computers and office equipment. Later in this article, we'll talk about how to strike a balance between high quality and low price. 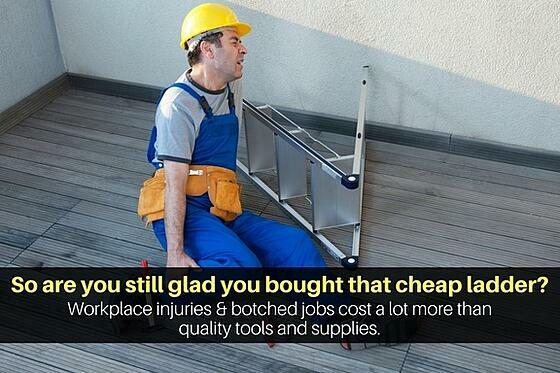 If you're always on the hunt for cheap tools for field service, stop right now. Low-quality tools and parts lead to low-quality installations and repairs—and those, in turn, lead to upset customers. 'In the same way that people quickly forget a high price if you deliver high quality, they’ll also forget the low price if you deliver low quality', says Peter Crocker in his article 'False economy: Beware the lure of the quickie' on the Australian site FlyingSolo. 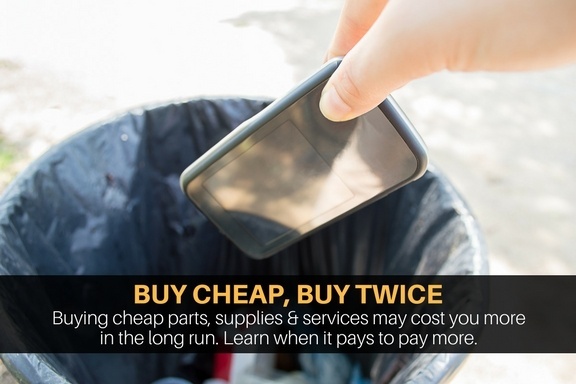 Not only that, if you're not careful, the cheap parts you buy will not only break faster than quality parts—they can also be unsafe. Fraying electrical cords and faulty power tools are a hazard for your field service engineers and everyone around them. MORE READING: 6 Big Reasons to Digitalise Your Stock (And a Freebie for When You Can't). Whether you're looking for accounting software or the best service management software, it can be tempting to go cheap (or even free). In the end, though, this can end up costing you way more time and hassle than the few pounds you saved. If you purchase cheap software on eBay, Craigslist, or Amazon Marketplace, it's most likely counterfeit. And even if it's not, some software companies won't officially recognise you as an owner of their software, and won't offer support for the products you buy on these sites. Not to mention, oftentimes free and cheap software is harder to set up and maintain, is more difficult to use, doesn't do the job well, and comes with little or no customer support. Why pay for pricy high-end tablets or phones for your field service engineers when you can score these necessities for as little as £50? There's actually a good reason behind tablet prices, according to CNET's 2017 tablet buying guide. 'Amazon can offer its affordable Fire tablet because it has a bare-bones design, skimps on any extra features and has a very limited app store', CNET says. 'And despite the fact that the iPad Pro has no native HDMI or storage expansion support, Apple can justify its lofty starting price thanks to its premium design, fast performance, incredible app support, refined interface and robust ecosystem'. CNET also notes that smaller tablets are cheaper, but also underpowered when compared with larger ones. As for smartphones, HowToGeek reports that many affordable phones have either low-end hardware, or high-end hardware that's a few years old. 'This is one of the most effective ways to keep costs down, but that always means performance takes a hit', says writer Cameron Summerson. Not only that, but the screen displays aren't as sharp and the cameras are generally of lower quality, which can be a problem when your engineers need to take photos of repairs or installations. While you probably don't want to scrape the bottom of the price barrel when shopping for devices (or anything else), in our article '8 Tech Tools to Make Your Field Service Business WAY More Productive' we unearthed some good bargains for field service businesses on smartphones, tablets, and smartwatches. There are good bargains to be had out there, as long as you aren't obsessed with scoring the very lowest price on everything you purchase for your business. Here's how to make it happen. When you buy parts, office equipment, software, or service, you're paying for more than just that item. You're also paying for everything that goes into creating the thing, as well as all the benefits that come along with it. When you buy a computer, you're also paying for the employees that man the computer company's helpdesk. When you purchase a part online, you're also paying for the speed of delivery, the quality of the manuals, and the attentiveness of the supplier's customer service staff. These all impact your business—and how your customers view your business—so be sure to evaluate all aspects of the product or service you're buying, and not just the thing itself. The company you're evaluating might have the best sales copy ever, but you can get the real deal by reading customer reviews. Again, look for reviews that critique not just the item itself but also the customer service and other key features of the purchase. Also note how the company responds to negative reviews to get a good idea of their customer service skills. MORE READING: Prospects are looking at reviews of your business, too. Here are 10 ways to get more online reviews. If you're friendly with other business owners, ask for their suggestions on affordable-yet-quality products and services, and for their opinions on parts, supplies, or software you're thinking of buying. No field service friends? Ask in an online industry forum instead. Search for 'best budget laptops' (or 'best budget smartphones' or whatever you're looking for), and you'll find that many experts and websites have helpfully compiled lists of their top picks just for you. Finally, just as you don't want to automatically jump at the lowest-priced parts, services, software, or supplies, you also don't want to be the low-price leader in your area. In his article 'The 7 Biggest Mistakes That HVAC Contractors Make', HVAC expert Allison Bailes lists 'Trying to be a low bidder' as one of the biggest blunders. 'The race to the bottom results in everyone being a loser,' he says. 'The ones who don't get the contract lose. The one who gets the contract can't do the work properly because they have to scrimp on labor and materials. And the homeowner loses because, as the saying goes, you get what you pay for'. Hard to believe? Click below to download a case study written in one of our clients' own words.